I quote the help in Drupal: "The Taxonomy module allows you to classify the content of your website. To classify content, you define vocabularies that contain related terms (or tags), and then assign the vocabularies to content types. For more information, see the online handbook entry for the Taxonomy module." The Article content type has already activated the tags field, the others need its inclusion, clicking in Add existing field item inside manage fileds form at the link: http://my_site/admin/structure/types. In my site I configured the form in http://my_site/admin/structure/taxonomy/tags/edit using this item "Translate. Different terms will be allowed for each language and they can be translated.". Every time I have to publish an article, I take different decisions. If the tags have already been set, no problem: the translation is automatic. 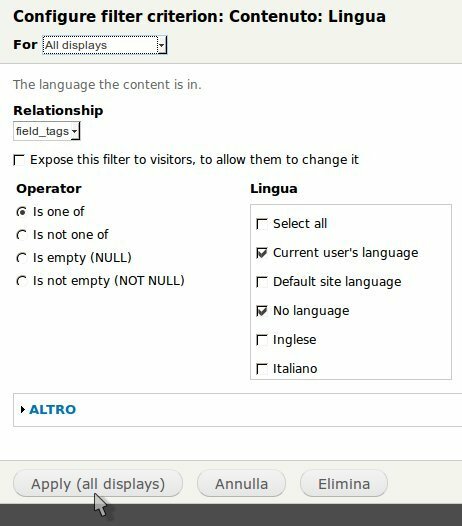 If they don't exist, I must verify the correct language (Language neutral, Italian or English?) before the final pubblication. In any case I can check the web page: http://my_site/admin/structure/taxonomy/tags and change the Language type clicking edit link. Finally, If the tag needs localization, I can click in the link TRANSLATE and then I add the correct translation. Wikipedia describes it as a visual representation for text data, typically used to depict keyword metadata (tags) on websites, or to visualize free form text. Tags are usually single words, and the importance of each tag is shown with font size or the number of times that it is used in brackets. 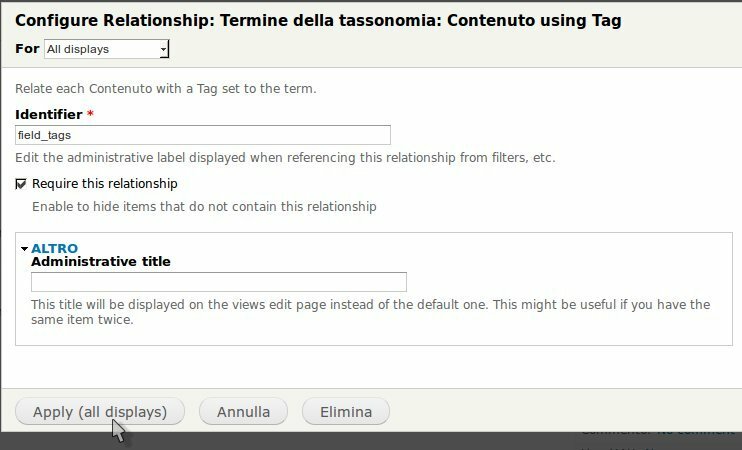 (13/06/2013) If you don't want to print any similar or useless tags in this view, you can add in FILTER CRITERIA this item: Content: Tag then select is not one and type the list of undesired tags in Select terms from vocabulary Tag.